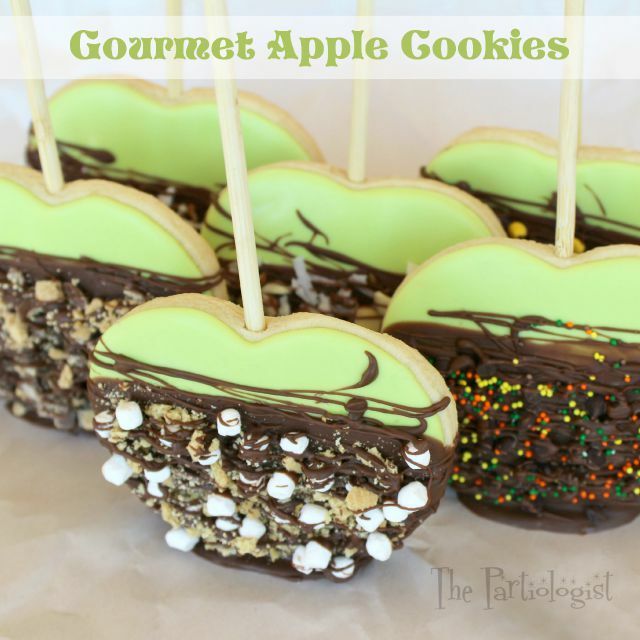 The Partiologist: Gourmet Apple Cookies! 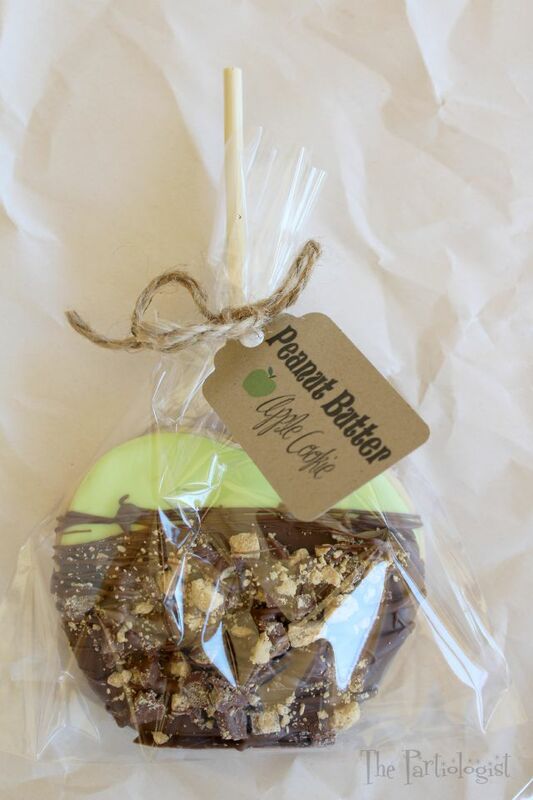 Without hesitation, I can say a chocolate covered caramel apple is one of my favorite desserts. 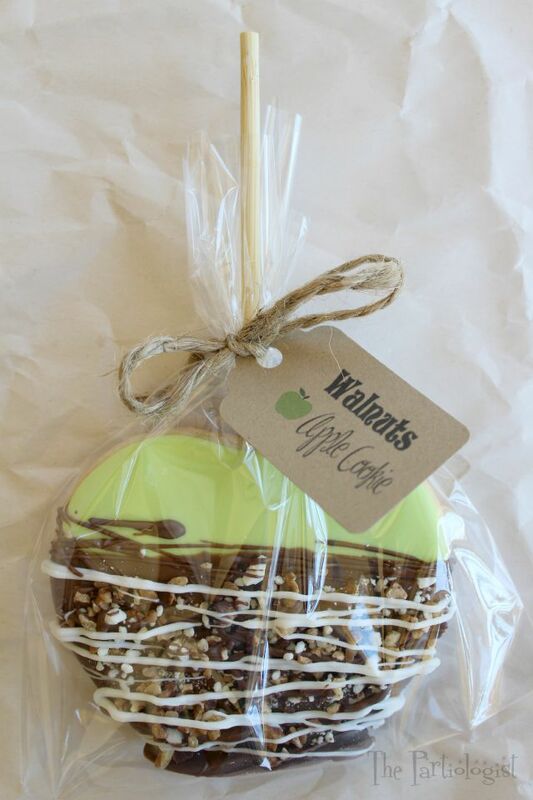 Even with all the sweets in my kitchen, I find myself craving one of those big chocolate covered caramel apples you can buy. Because the base is an apple and I choose the one covered with dark chocolate, it's good for you. I always tell myself that. While staring from the selection of apples covered with just about everything imaginable, I got to thinking about cookies. Gourmet Apple Cookies to be exact and I thought, why not? I wanted them to stand alone, just like those in the case. 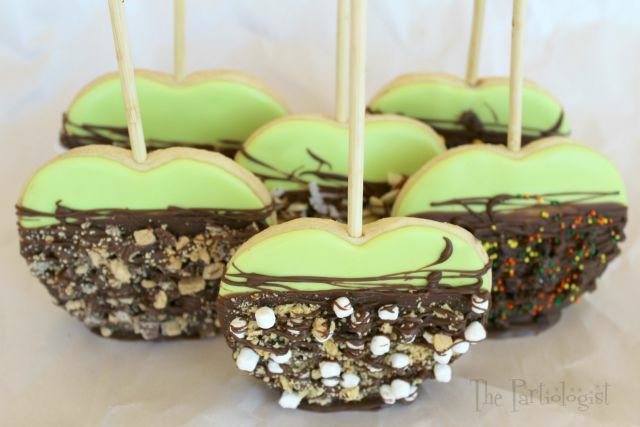 Each apple is a sugar cookie covered with royal icing, dipped in chocolate, covered with all kinds of sugary goodness and drizzled with more chocolate. I had a hard time not eating one. The only way I wouldn't get into them was to package them up! Grab your apple basket and let's get started. Choose any apple cookie cutter. After cutting the apple shape, go back and trim the top to remove the stem and leaf. While the cookies are baking, you'll need to grab the cookie/apple sticks. 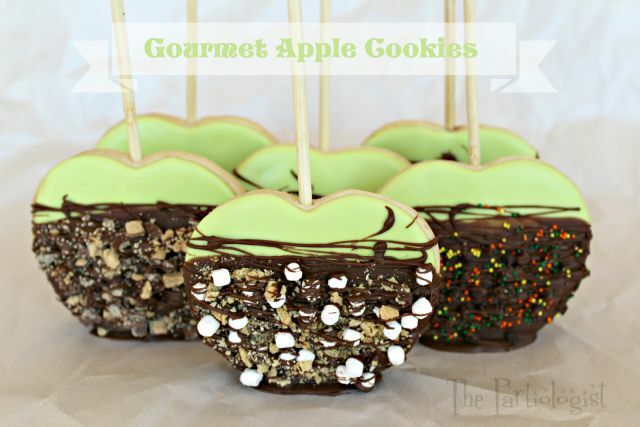 After the cookies are baked, you can make the Gourmet Apple Tags. Print on brown kraft card stock and punch with the 2 1/2" Recollections Lever Punch, link below. As soon as the apples come out of the oven, insert the cookie stick. 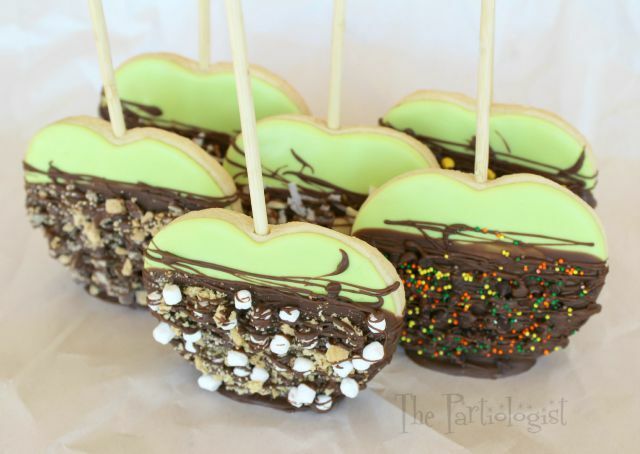 Cover each apple with green royal icing. I used green food color with a little yellow and just a teensy weensy blue. Let the apples dry overnight. Now it's time to gather the toppings for the apples. Melt the chocolate for dipping. Once you dip your apple in the chocolate, stand it up to dry. 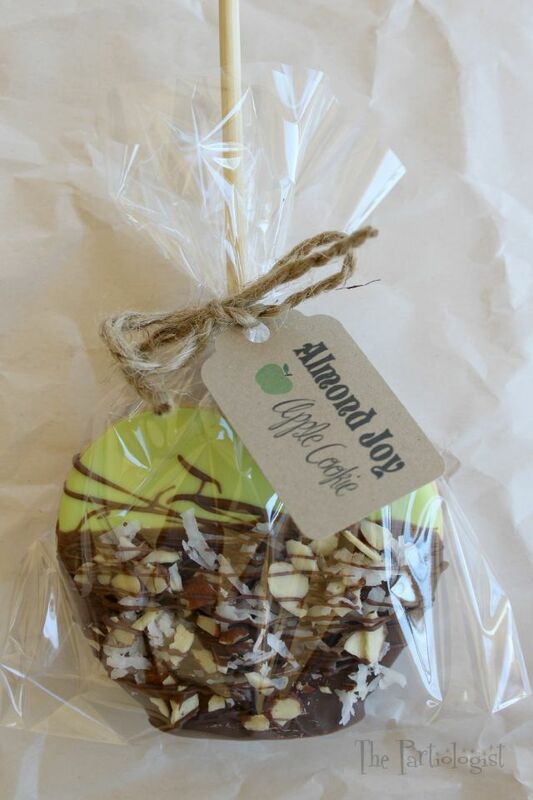 Use parchment paper squares and let some of the chocolate drip down, making a puddle for the apple. Prop the apple either up against the wall or even prop against plastic cups. 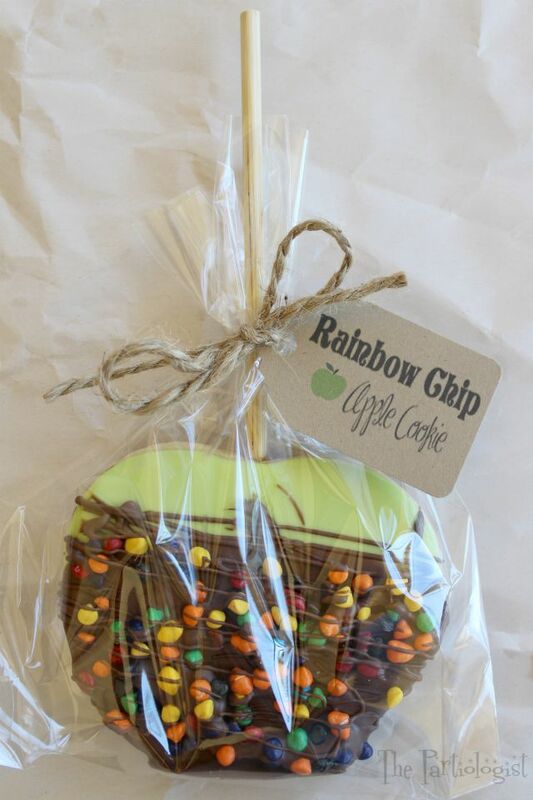 Once the chocolate is dry, the apple cookie will stand by itself. 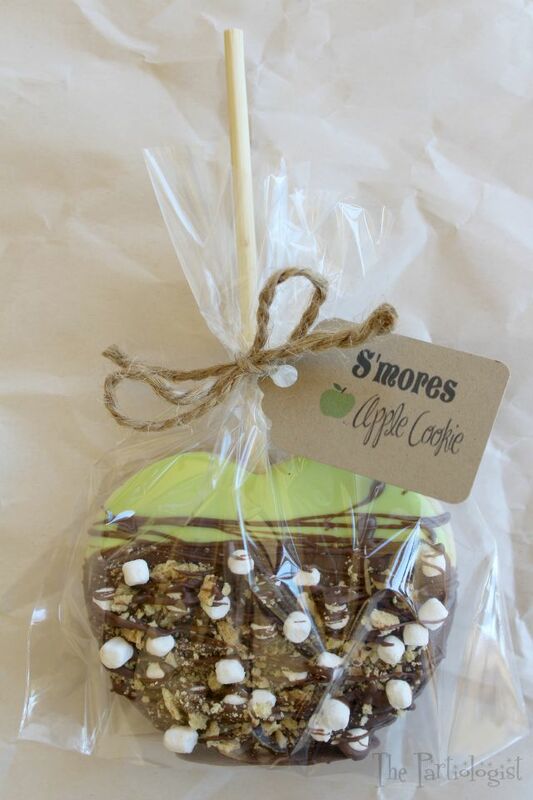 The first apple I made was the S'mores. Lay the apple down on parchment paper. Start by sprinkling the chopped grahams on the top of the chocolate. Add the Jet Puffed mallow bits marshmallows to the grahams. 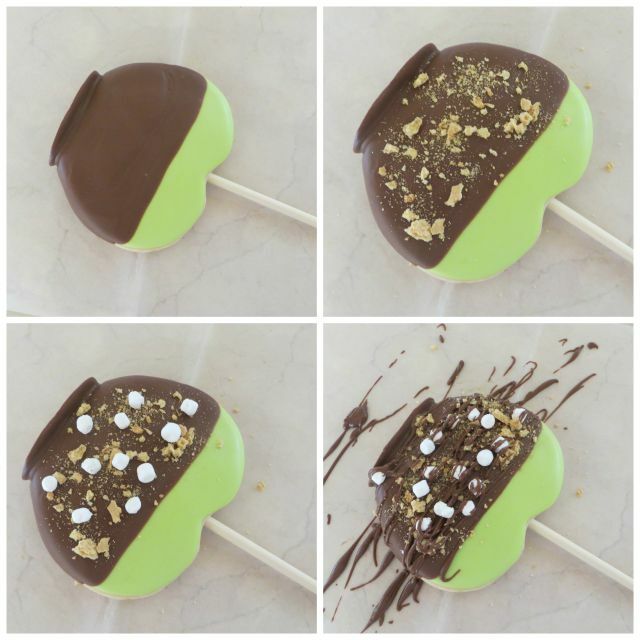 You can drizzle with a spoon, or pour a little chocolate (dark and white) into a baggie, snip the end and drizzle. Before I was too tempted, I decided to package them with jute and the cute tag. One bad apple, doesn't spoil the whole bunch! Wonderful idea! I'm certain they taste as wonderful as they look! Yum!!! You are a GENIUS Kim!!! Oh my goodness how I love these! Am pinning these to make this fall for sure. Thank you! Thank you Christine and thank you for pinning! Well, you're sure sweet, thanks!! These cookies are the BEST!! I really need to make some asap! Yum!! awesome idea so creative. Thank you Clarisse, they were fun to make, so many possibilities! Oh I get it.......the puddle created after you dip the cookie is what makes it stand. And....the drizzling is what attaches the toppings to the cookie. Was wondering how you did that as the chocolate would be set after you've stood it to dry. you're genius! Bet these would go over real well at a fundraiser. I hit the send button (with my 1st comment) too quickly. How about putting some apple flavoring in either the cookies or frosting - or both! After I made the cookies, I thought hmmm, I should have added apple flavoring! 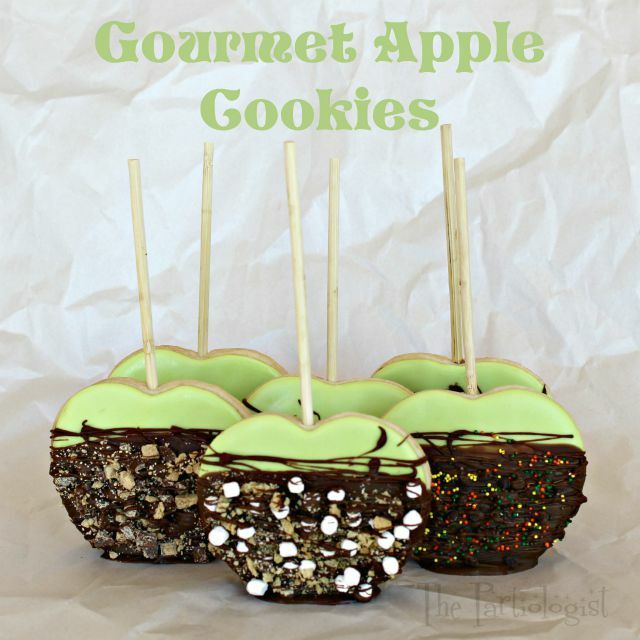 Right now there are a few recipes out there for apple flavored cookies and I do think they would be perfect for this! Thanks!!! These are adorable and I am sure they are so yummy too :) Thank you for linking up to The Party Gals Linky Party! Thank you Blanca, I was happy to link up! 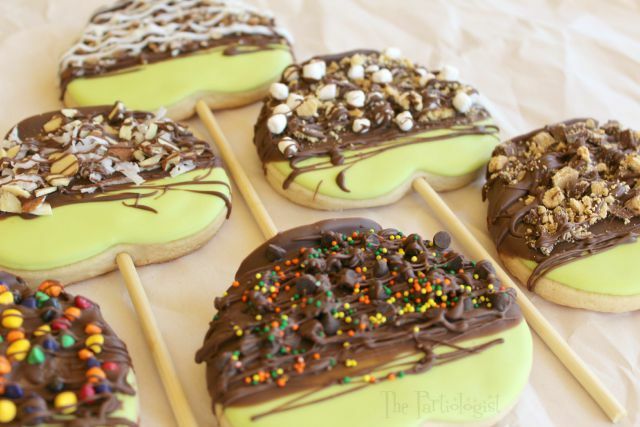 You have no idea how much I want to drop everything and make these! Thanks for submitting them at Fun Family Crafts! Thank you so much for stopping by, I do hope you find time to make these, they were so much fun! P.S. I love Fun Family Crafts! These are fabulous!! Thank you for sharing! You're so welcome - and thank you for the sweet comment! Aww, thank you so much for the comment! Your cookies are amazing! 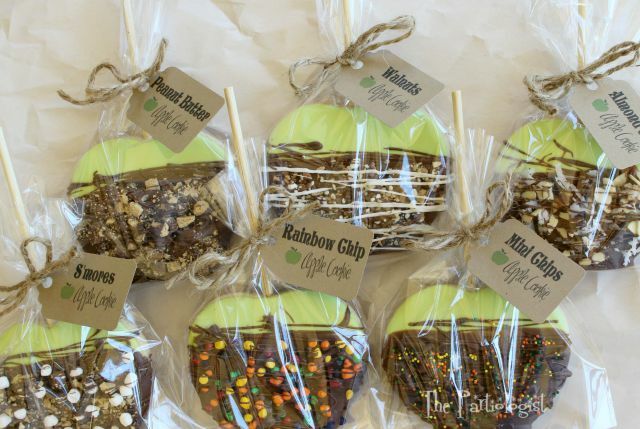 I love those caramel apples covered in chocolate and candies too. It's deliciousness on steroids! Your cookies? Love them! Thank you so much, I totally agree with you about those apples! Cutest thing I've ever seen! 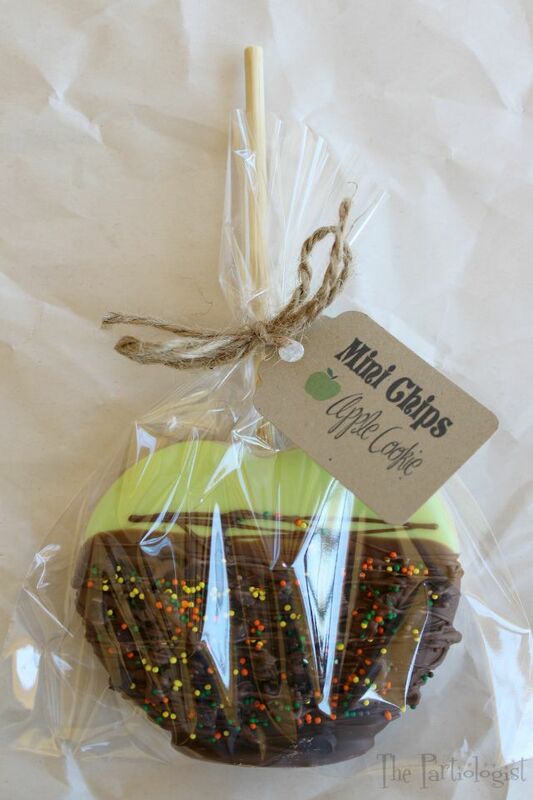 I make gourmet caramel apples at home every year, but I also love making designer sugar cookies-You just meshed the two! I LOVE IT!! I will admit that I plan on adding a layer of caramel first and then the chocolate. YUM! Thanks for the idea! Thank you Bonnie! I love the idea of adding a layer of caramel too, delicious! What a great fall gift for friends. I''m going to have to try and make these one day. Oh, I know you're friends will love them!